ROV Deep Discoverer (D2) as seen from the camera platform Seirios, investigating boulders at the base of the landslide scarp visited during Dive 01. Image courtesy of the NOAA Office of Ocean Exploration and Research. Download larger version (jpg, 1.0 MB). Dives 01 and 02 of the NOAA Ship Okeanos Explorer Northeast U.S. Canyons Expedition 2013 explored areas of interest to the U.S. Geological Survey (USGS) Marine Hazard Group in Woods Hole, Massachusetts, as part of the ongoing assessment of the submarine landslides along the continental margin offshore the U.S. east coast and their potential role in generating tsunamis. Dive 01 on July 9 targeted a 250-meter high landslide scarp along the continental slope south of New England at a depth of 1,800 meters. The purpose of studying landslide scarps is to determine if they reveal evidence of the age of the landslide and if it is possible to determine at what rate and how they degrade over time. 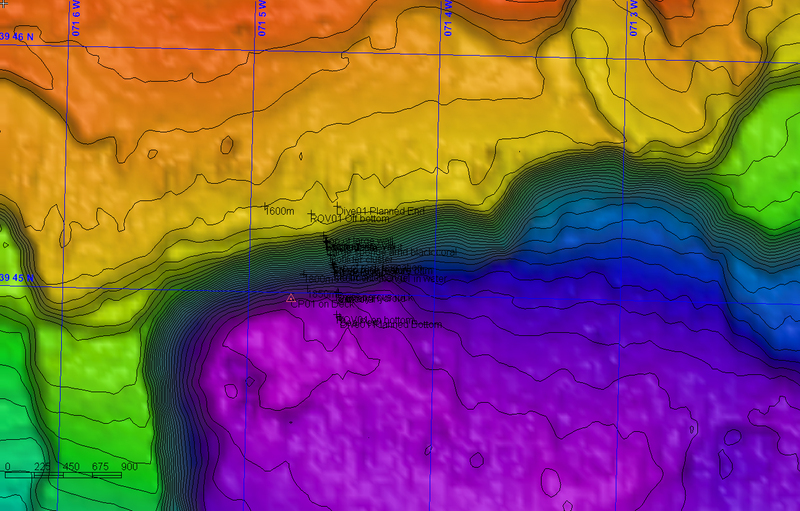 Multibeam map of the Dive 01 overlaid with the track of ROV Deep Discoverer (D2). Multibeam sonar helps scientists identify potential targets for exploration and helps ROV pilots navigate. Image courtesy of the NOAA Office of Ocean Exploration and Research. Download larger version (jpg, 884 KB). 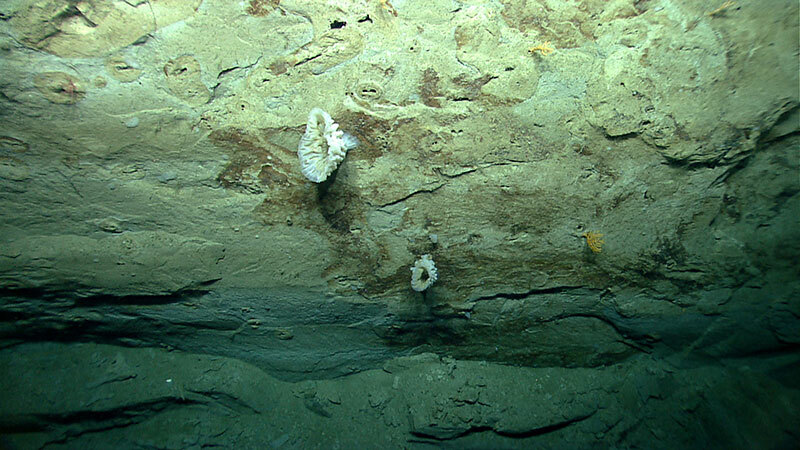 Beginning approximately 100 meters from the base of the scarp, the remotely operated vehicle (ROV) Deep Discoverer (D2) moved over what is referred to by geologists as a colluvial wedge, often a chaotic accumulation of sediments shed from the steep scarp above. Numerous large angular and fractured boulders of what appeared to be mudstones ornamented by bioturbation (reworking of soils and sediments by animals or plants) and physical erosion features were encountered as D2 approached the base of the scarp. Many of these boulders provided favorable habitats for many sessile (non-moving) organisms, including corals such as Desmophyllum sp. and Paramuricea sp. Scouring around the base of each of these boulders suggests that bottom currents play a role in shaping the seafloor in this area. The seafloor in this image is a mix of semi-consolidated to consolidated material overlain by sediment, providing a number of different types of habitats for sessile and mobile fauna. Image courtesy of the NOAA Office of Ocean Exploration and Research. Download larger version (jpg, 1.6 MB). 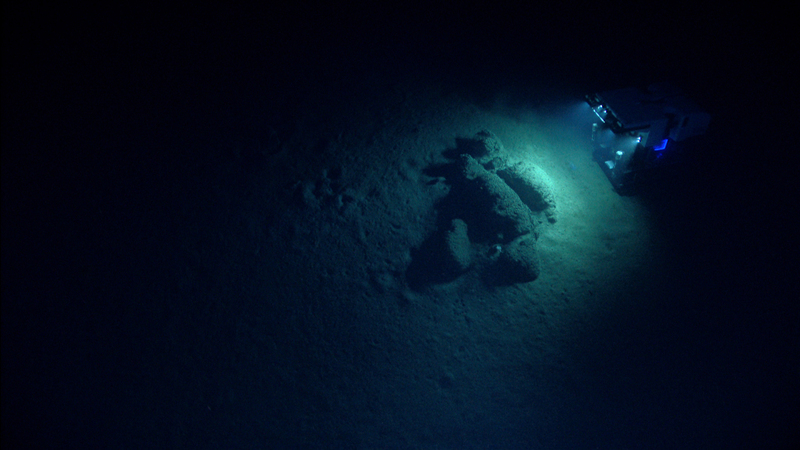 For the remainder of the first dive, the ROV traversed several near-vertical cliffs composed of exposed mudstones, at times heavily eroded through bioturbation (providing excellent habitats for many animals) and continuous shedding of the cliff face along small fractures, separated by accumulations of sediment and broken rock. Some of the most intriguing features seen along the vertical walls were circular to elongate shaped burrows that often seemed more resistant to erosion than the surrounding rock and surficial staining of the rock surface, possibly a result of oxidation of iron minerals. Mudstone outcrops along the upper portion of a 250-meter-high landslide headwall scarp located on the lower continental slope south of New England visited by ROV Deep Discoverer (D2) during Dive 01. Image courtesy of the NOAA Office of Ocean Exploration and Research, Northeast U.S. Canyons Expedition 2013. Download larger version (jpg, 1.5 MB). Angular mudstone boulder sitting on silty-clay sediment at the base of the landslide scarp investigated during Dive 01. Several corals (Paramuricea sp. ), hydroids and other organisms have attached themselves to the boulder. Image courtesy of the NOAA Office of Ocean Exploration and Research, Northeast U.S. Canyons Expedition 2013. Download larger version (jpg, 1.4 MB). The goal of Dive 02 on July 10 was to investigate a group of pockmarks (10 to 20 meters deep, 100 to 200 meters wide, circular to elongate depressions in the seafloor) in water depths between 500 and 650 meters along a section of the continental slope west of Veatch Canyon. 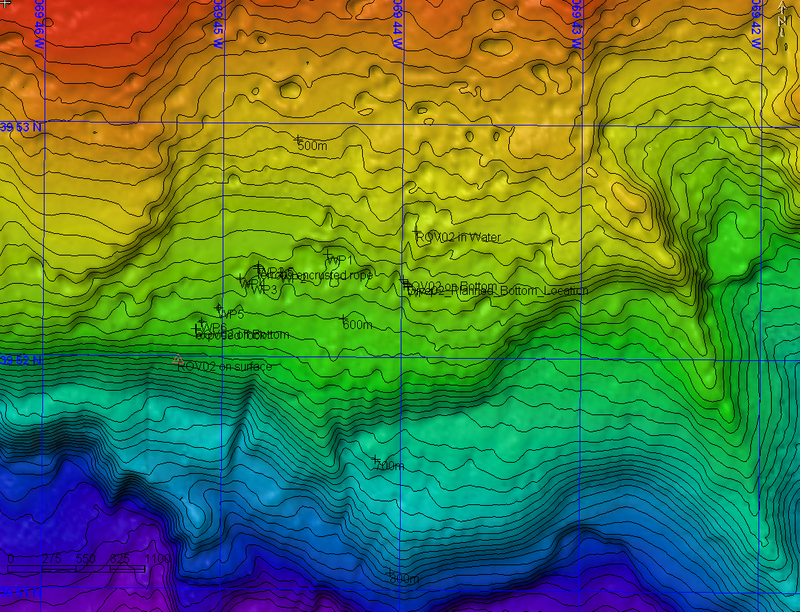 Multibeam map of the Dive 02 overlaid with the track of ROV Deep Discoverer (D2). Multibeam sonar helps scientists identify potential targets for exploration and helps ROV pilots navigate. Image courtesy of the NOAA Office of Ocean Exploration and Research. Download larger version (jpg, 1.2 MB). Mapping of the continental shelf and slope along the U.S. east coast between Cape Hatteras and Georges Bank has revealed that pockmarks are abundant features of the seafloor. The relationship of these pockmarks to the sub-surface movement and seafloor venting of fluid and/or gas and the pockmarks’ role, if any, in controlling the location and triggering of submarine landslides are just two of the larger questions being investigated. On descent to the first of the pockmark features, D2 encountered a large swarm of krill and amphipods, which continued to follow us for the rest of the dive, at times making it difficult to see the seafloor. A drape of soft, silty sediments were encountered throughout the dive, with no variation noted between the seafloor inside or outside the pockmarks, indicating that the pockmarks may not be active fluid/gas venting features at this time. A number of igneous cobbles and boulders were encountered in several of the pockmarks, likely deposited as dropstones from melting icebergs. 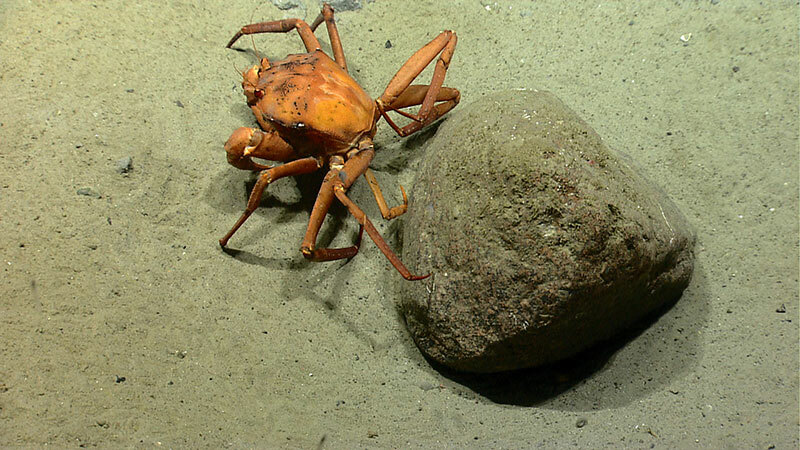 Although geologic observation was the primary goal of this dive, biology took center stage, when huge numbers of red crabs (Chaceon quinquedens) were encountered throughout the ROV’s time on the bottom. 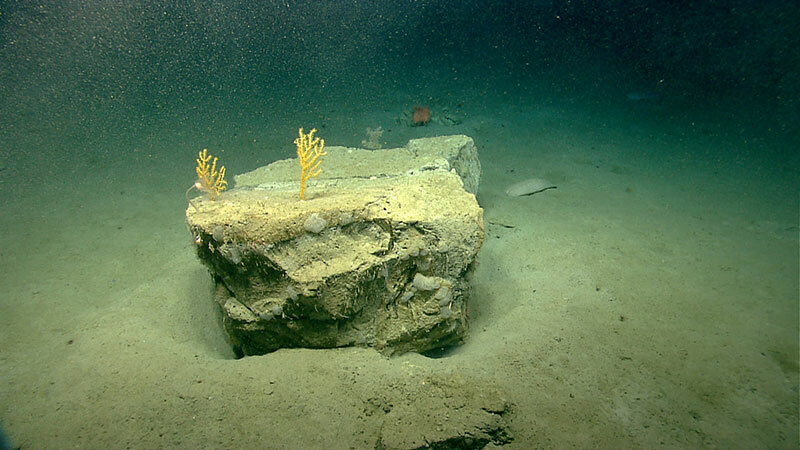 Round igneous rock, most likely dropped from a melting iceberg, sitting in soft sediments within one of the pockmarks investigated during Dive 02 in water depths between 500 and 650 meters. 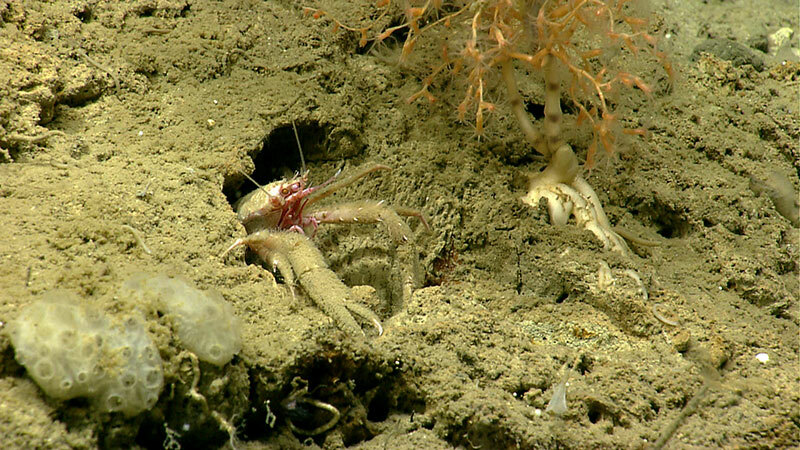 Image courtesy of the NOAA Office of Ocean Exploration and Research, Northeast U.S. Canyons Expedition 2013. Download larger version (jpg, 1.4 MB). 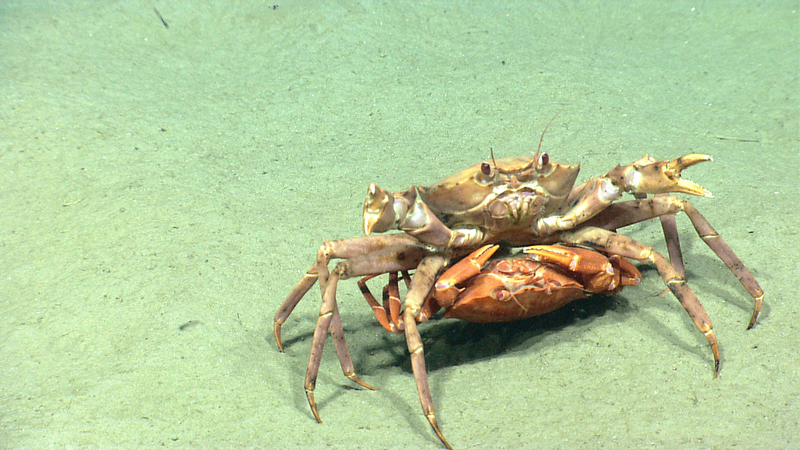 One of the numerous Atlantic deep-sea red crab mating pairs seen by ROV Deep Discoverer (D2) during Dive 02. The male crab is carrying the inverted female. Image courtesy of the NOAA Office of Ocean Exploration and Research, Northeast U.S. Canyons Expedition 2013. Download larger version (jpg, 1.6 MB). Overall, these were two very successful dives, providing valuable and exciting observations of both the geology and biology of sections of the continental margin along the U.S. east coast that have not been viewed before. Observations made of the landslide and pockmark features will be used to test a suite of hypotheses to help us better understand the evolution of the region and potential for marine geologic hazards. These initial ROV dives of the Northeast U.S. Canyons Expedition 2013 are some of the first telepresence-enabled activities undertaken by members of the USGS marine hazards group in Woods Hole and provide a powerful new tool for ongoing hazard investigations in the Atlantic and Pacific Oceans, Caribbean Sea, and other marine regions.